A few copies were unearthed in the move from Manhattan to Brooklyn. These are mint quality, some in the original 1986 shrink- wrapping. The price will increase as the number remaining decreases. Arthur, Paul, “The Last of the Last Machine? : Avant-Garde Film Since 1966,” pp. 69-93. Brakhage, Stan, “Stan Brakhage at Millennium: November 4, 1977,” pp. 297- 307. 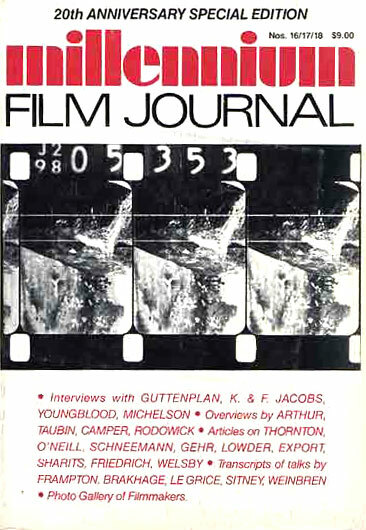 Broderick, Peter, “Since Cinema Expanded: Interview with Gene Youngblood,” pp. 55-66. Bruno, Giuliana, “Women in Avant-Garde Film: An Interview with Annette Michelson,” pp. 141-48. Camper, Fred, “The End of Avant-Garde Film,” pp. 99-124. Carroll, Noel, “A Brief Comment on Frampton’s Notion of Metahistory,” pp. 200-05. Cartwright, Lisa and Peter Gidal, “Rose Lowder’s Composed Recurrence,” pp. 176-79. Doane, Mary Ann, “The Retreat of Signs and the Failure of Words: Leslie Thornton’s Adynata,” pp. 151-57. Frampton, Hollis, “A Letter to Brakhage,” pp. 212-13. Frampton, Hollis, “Three Talks at Millennium,” ed. Tony Pipolo, pp. 274-94. Gunning, Tom, “Signaling through the Flames: Ernie Gehr’s Signal-Germany on the Air,” pp. 169-73. Hanlon, Lindley and Tony Pipolo, “Interview with Ken and Flo Jacobs,” pp. 26-53. Jenkins, Bruce, “Gently Down the Stream,” pp. 195-98. Kiernan, Joanna, “Films by Valie Export,” pp. 181-87. Le Grice, Malcolm and P. Adams Sitney, “Narrative Illusion vs. Structural Realism,” talk ed. by Noel Carroll, pp. 309-26. Liebman, Stuart, “Paul Sharits S:TREAM:S:S:ECTION:S:ECTION:S:S:ECTIONED: Paradigm Lost, or Adventures of the Dialectic,” pp. 190-94. Lovelace, Carey, “The Gender and Case of Carolee Schneemann,” pp. 162-68. MacDonald, Scott, “The Millennium After Twenty Years: An Interview with Howard Guttenplan,” pp. 9-24. Pipolo, Tony and Grahame Weinbren, eds., “A Montage of Voices: Twenty Years of Filmmakers’ Statements,” pp. 250-73. Pipolo, Tony and Lindley Hanlon, “Interview with Ken and Flo Jacobs,” pp. 26-53. Rodowick, David, “Modernism, Epistemology, and Politics,” pp. 126-37. Sitney, P. Adams, “Saugus Series,” pp. 158-61. Taubin, Amy, “Not Reconciled,” pp. 95-97. Weinbren, Grahame, “Film Space: An Outline Study,” pp. 328-35. Wollen, Peter, “Landscape, Meteorology, and Chris Welsby,” pp. 208-11.